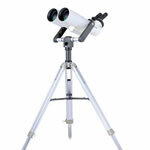 The Takahashi TSA-120 refractor provides exceptionally high optical and mechanical quality for the serious visual observer and astrophotographer who needs portable optics. 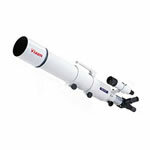 The TSA-120 is exceptional for observing and imaging within the solar system. Its images of subtle lunar and planetary details are sharp, with realistic and highly saturated color. They are free from chromatic aberration's violet haze of spurious color, thanks to the scope's ED triplet optics. The latest broadband antireflection multicoatings and numerous knife-edge internal baffles assure the maximum image contrast possible. This 4.72" Takahashi has excellent light transmission and diffraction-free true color images that make it superb for deep space observing and imaging, as well. Binary stars and globular star clusters are particularly well-resolved and vivid, with the contrasting colors of many binary systems showing nicely. The brighter nebulas and galaxies stand out against a very dark sky background. 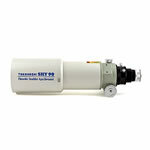 The f/7.5 focal ratio and 900mm focal length of the TSA-120 are long enough, using a Takahashi 2.8mm ED eyepiece to provide 321x, for high magnification observations of the Moon and planets, yet it will also produce a huge 2.72 degree field at 18x, using a 2" Takahashi 50mm eyepiece. Apochromatic triplet ED refractor optics: 4.72" (120mm) aperture, 900mm focal length, f/7.5 Ortho-Apochromatic triplet lens using an FPL-53 ED (Extra-low Dispersion) glass element between two crown glass elements for images that are free from spurious color (chromatic aberration). For more details, click on the "Takahashi triplet lens" icon above. Multicoated optics: Fully coated on all surfaces with multiple layers of broadband antireflection materials for high light transmission and good contrast. 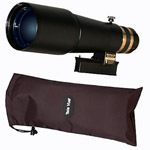 Retractable dew shield: Slows the formation of dew on the lens to extend your undisturbed observing time. Also improves visual and photographic contrast by shielding the lens from off-axis ambient light (the neighbor's yard light, moonlight, etc.) For transport, the retractable lens shade keeps the overall length of the optical tube to a very manageable 28" when it is retracted and the visual extension tube removed. 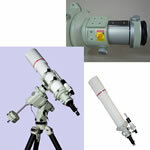 Rack and pinion focuser: 2.7" focuser, with a 2" eyepiece/accessory holder that threads into the 2.7" focuser drawtube. 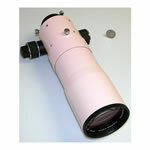 A 1.25" compression ring eyepiece/star diagonal holder is also supplied. The non-marring soft nylon compression ring of the 1.25" eyepiece holder won't scratch the barrels of your accessories or star diagonal, as ordinary thumbscrews can. Dual focusing knobs provide precise image control with either hand. The large focus knobs are easy to operate, even while wearing gloves or mittens in cold weather. A large thumbscrew locks the focuser tube in place without image shift for photography. A useful photographic accessory would be the Takahashi #CAA102 camera angle adjuster, shown below. 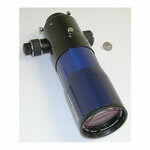 This attaches to the 2.7" focuser drawtube in place of the 2" eyepiece holder. It allows the photographic accessory train to be rotated to the most appropriate angle to frame the object being photographed (a landscape format, portrait, or any angle in between) without having to loosen the camera adapter and perhaps lose the correct focus. Once the camera is oriented correctly, a large knob on the side of the adjuster can be tightened to hold the camera in place during the exposure. It is also very handy for visual applications to position the star diagonal or binoviewer at the most comfortable viewing angle. 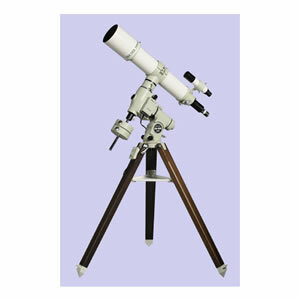 Finderscope mounting point: No finderscope is supplied when this optical tube is bought alone. 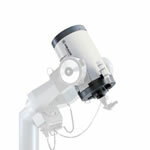 A flat boss with two mounting bolt holes is provided on the top of the focuser body for mounting an optional Takahashi 7x50mm 6.2 degree field finder and bracket finderscope. Long back focus: Back focus is a very good 227.5mm, allowing the stacking of a wide variety of CCD cameras, color filter wheels, electric focusers, camera angle adjusters, and film cameras. Optional photographic accessories: Two accessories are available to provide a variety of image scales and sky coverage: a field flattener and a focal reducer. The field flattener (#TOA130FF) reduces the focal ratio slightly (to f/7.3), but gives pinpoint stars to the very edges of a 40mm (2.6 degree) image circle for virtually unvignetted 35mm/DSLR/large format CCD images. The focal reducer (#TOA130R) effectively cuts the focal length to 672mm and the focal ratio to f/5.6. The photographic field is now 3.4 degree, spread over a 40mm image circle for virtually unvignetted 35mm/DSLR/large format CCD images. 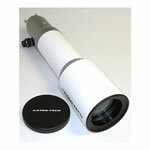 A variety of photographic coupling attachments and eyepiece projection photography adapters are also available. 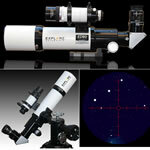 Mounting rings: No mounting rings are supplied for the 125mm diameter 15.4 pound optical tube. Several options are available. One is the Takahashi clamshell-type tube holder (#120TH) shown below that is designed specifically for mounting the TSA-120 on a Takahashi EM-11 or larger equatorial mount. The second option is the Takahashi double ring tube holder with bridge (#120DTH) shown below. It can be mounted on a non-Takahashi mount, such as a Celestron CGEM or CGE Pro or Losmandy GM-8 or G-11, by using an optional dovetail plate. This double ring tube holder can also be used to mount the TSA-120 on a Takahashi EM-11 or larger equatorial mount by adding optional Takahashi #TMP106 double ring tube holder mounting plate. A third option is a pair of Parallax split mounting rings (#PFS106), also shown below, for mounting on a non-Takahashi mount, using an optional dovetail plate.